Companies with large, decentralized sales forces, multiple layers of sales management, and a collaborative approach to managing sales territories are a perfect fit for ProAlign Web sales territory alignment software. You can cooperatively create, modify and share territory alignments online, gaining input from sales managers anywhere in your organization who have the local account and customer knowledge critical to designing optimal territories. Sometimes getting field and local sales personnel involved can be a logistics challenge and lead to delays in completing new territory assignments. Not anymore. ProAlign Web provides secure online access for authorized sales management to view and propose changes to territory alignments. You’ll save weeks on complex sales territory projects. ProAlign Web is sold on a “Software as a Service” basis, which eliminates the burden and costs of software installation, maintenance, and any server requirements. Upgrades happen seamlessly without your involvement. Users have permission levels for manipulating and viewing data — the system will show only those geographic areas authorized for each user. Built in communication — allows integrated notes, requests and approval processes. 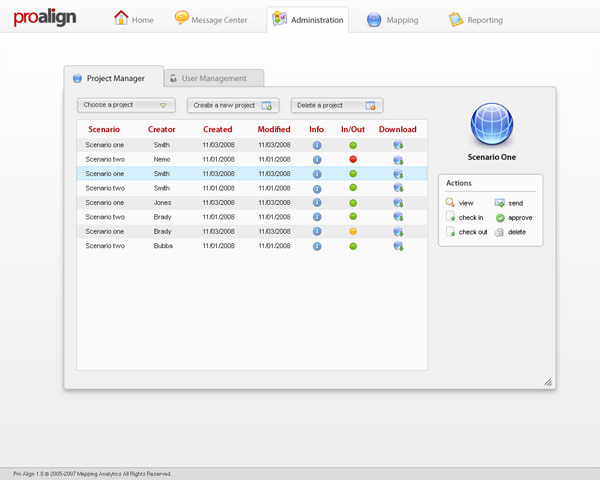 Every installation of ProAlign Web is fully integrated with and includes ProAlign Desktop. Built on ESRI ArcGIS ® mapping technology, the world’s number one mapping software. ProAlign Desktop offers an additional robust portfolio of analytical, database and mapping features for the sales manager or sales operations analyst. The “2005 McKinsey Customer and Channel Management Survey” found that when sales territory management was used strategically against the highest value accounts, sales teams generated three times more market share while experiencing selling and marketing costs 20% lower than those who only reorganized.